Verizon Wireless will be the first U.S. carrier to offer a Project Tango smartphone to its customers. The forthcoming Asus ZenFone AR will arrive later this summer, according to Google executive Johnny Lee. The ZenFone AR is significantly smaller than the first Project Tango handset, which was the Lenovo Phab 2 Pro. The ZenFone AR will also be compatible with Google's Daydream virtual reality platform. Asus first announced the ZenFone AR in January. It sports a 5.7-inch WQHD AMOLED display, Qualcomm Snapdragon 821 processor, 8 GB of RAM, and a vapor cooling system. Triple cameras on the back support Tango applications with a 23-megapixel main camera, depth camera, and motion tracking camera. Other features include NFC, memory card slot, USB-C port, 3.5mm audio jack, and Cat 12 LTE. The 3,300 mAh battery supports Quick Charge 3.0. The exact availability is not yet known. The Zenfone AR from Asus is the first to support Google's Project Tango augmented reality and Daydream virtual reality platforms. This ultra-real Android smartphone lets you visualize what furniture might look like in your living room, or escape your living room altogether in favor of worlds unknown. 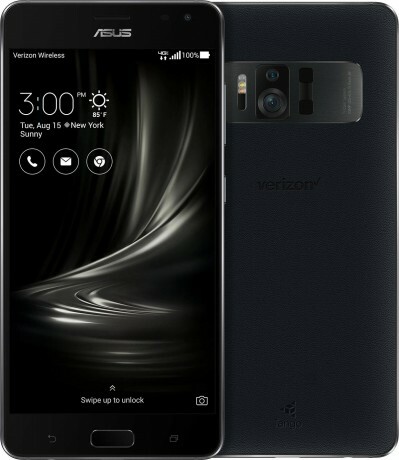 The Asus ZenFone AR for Verizon is the first phone in the U.S. to support Google Tango, the advanced AR (augmented reality) platform for Android. You can finally get a phone with Google's "Tango" AR technology in the US. The Asus ZenFone AR goes on sale with Verizon today. The Asus ZenFone AR is available to U.S. consumers today from Verizon Wireless.